1. Preheat the oven to 200°C, gas mark 6. Place the potatoes in a pan, cover with water, bring to the boil and simmer for 12-15 minutes, or until tender, then drain thoroughly. 2. Meanwhile, mix the garlic oil and rosemary in a large bowl, toss into the potatoes, stir to coat, then leave to cool. On a board, take a strip of pancetta, cut it in half, lay a potato at one end of each strip and gently roll up. Fix with a cocktail stick. Repeat until all the potatoes are wrapped. 3. Place the wrapped potatoes neatly on a lined baking tray and roast in the oven for 15-20 minutes until crisp and golden. 4. Remove and discard the plastic from the Vacherin. Return the cheese to its wooden box and place on a baking tray. Toss the thyme in the olive oil and spread on top of the cheese, then place in the oven for 5-10 minutes. 5. 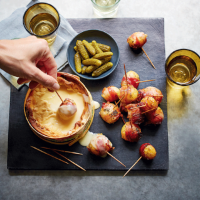 Serve the molten cheese with the skewered wrapped potatoes and some cornichons.